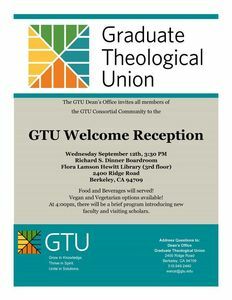 GTU students, faculty, staff, and the extended community are invited to the GTU Welcome Reception on Wednesday, September 12th at 3:30pm! We will have a light program at 4pm, where Dean Uriah Kim will introduce the GTU’s new president, Rabbi Daniel Lehmann. We will also invite all new staff, faculty, and visiting scholars to introduce themselves to the community. Please join us for food, drink, and fellowship!